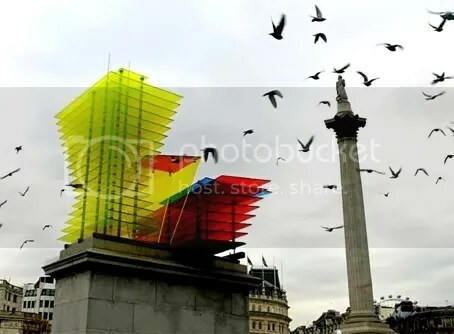 I’m a big fan of the fourth plinth. No, not Dan Brown’s new novel, the empty plinth in trafalagar square, erected in 1841 for a statue that never got built. As far as I’m concerned, it’s the best showcase for public art in london, and has been host to some brilliant pieces in the past, including Mark Wallinger’s Christ figure, and Marc Quinn’s Alison Lapper pregnant, both sculptures that quietly subverted the colonial grandeur of trafalgar square. Perhaps I’ll warm to it.